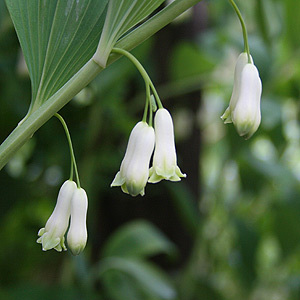 Nearly every gardener knows Solomon's Seal, however Polygonatum multiflorum and Polygonatum x hybridum, the plants that are widely offered for sale is just two of a number of garden worthy varieties. 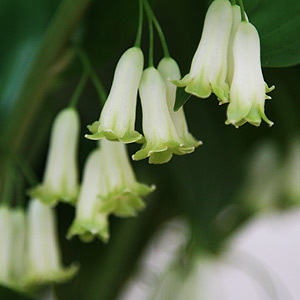 Polygonatum or 'Solomon's Seal' is from a large group of plants with polygonatum multiflorum, biflorum and odoratum being the most widely grown in the garden. Common varieties are readily available for sale from online nurseries. The low growing species P. hookeri with its pretty pink flowers, and P. graminifolium are worth looking for. A popular woodland plant much loved for the drooping white flowers help on long bracts in spring. A humus rich moist soil, or a woodland situation seems to suit most species. Polygonatum multiflorum is probably the most widely known of the 'Solomens Seal' and will generally reach around 70cm to almost 1m. The glossy foliage lasts well until autumn but it is the drooping white flowers that hang gracefully below the long stems that are the main attraction in spring. A plant that has been grown in the UK for centuries, the common types of olomon's Seal are easy to grow. If you have a cool shady position and a humus rich soil it will thrive. In fact it even thrives in poorer type soils. Choose a position in good filtered light, dappled shade. You should preapre the soil a little when planting. Dig in some well rotted compost and a little aged manure. The rhizomes that you purchased by mail order need to be planted a little below the surface and then watered in with a liquid fertilizer, seaweed, vermicast or similar, nothing to strong and not the granular types. Simply dig up the rhizomes in spring and look for the new buds that will be be pushing out. Divide into sections with 2 - 3 buds on each section and then replant. Polygonatum cirrhifolium of 'Coiling leaf Solomen Seal' this one will reach nearly 2m and has long leaves that curl near the tips. Polygonatum graminifolium is a lovely low growing species from Nepal, reaching around 15cm it is perhaps not as vigorous as others and forms a nice clump the pretty pink flowers in early summer are stunning, looks great in the rock garden or perhaps in a pot or container. Another dwarf species from the Himalayas is Polygonatum Hookeri this one has lilac to pale mauve flowers and will reach around 10cm. Polygonatum odoratum is a fragrant type. Polygonatum odoratum 'flora pleno' is the double flowered Solomon's Seal, rarely offered for sale but worth seeking out. Polygonatum falcatum 'Variegatum' good variegated foliage. Polygonatum verticillatum 'rubrum' is a rare Chinese variety with deep pink flowers. Retail, Mail Order Specialists, Online Webshop, Peat Free, Organic, Aquatic, Marginal and Bog Plants, Waterlilies, Hardy Geraniums, Ferns, Grasses, Shade & Woodland Perennials. Free online catalogue.